November 23rd, 2015. 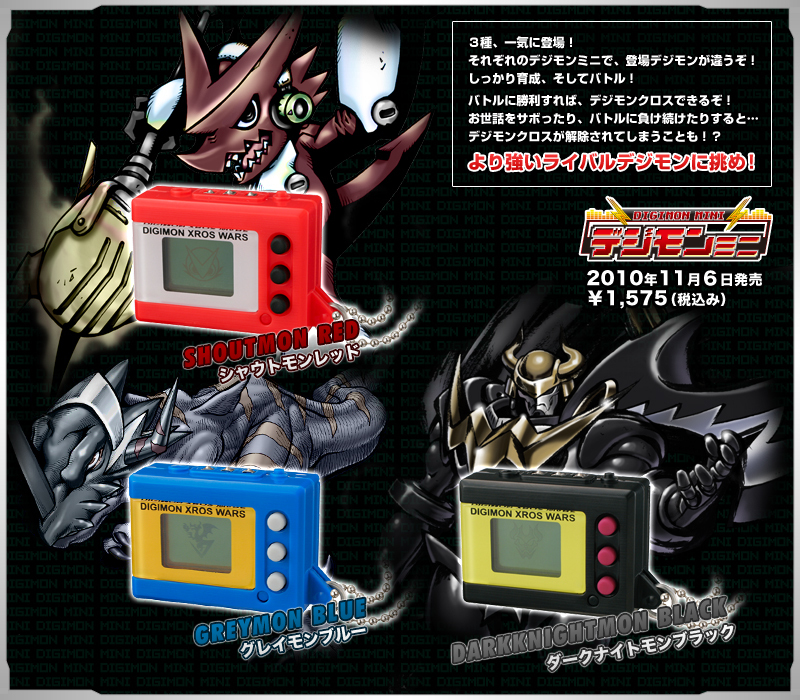 Today is a bite-sized anniversary for Digimon; ten years since the launch of the Digimon Mini. 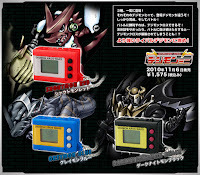 Originally created for Digimon's own ten year anniversary (June 26, 2007), and released several years in advance of that in 2005, the Mini stands out as a pivoting point in Digimon's history. Unlike previous toys, the Mini was the first time one of the franchise's virtual pets was targeted squarely at an adult audience, and ten years later we can still feel its effects as Digimon Adventure tri. steers us firmly away from being a Saturday morning cartoon. Similar to the Tamagotchi Mini seven months before it, the Mini was not just marketed as a pet, but also as a fashion device. 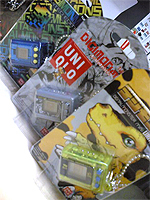 "Digimini-style" was a major campaign point for Bandai's latest pet, advertising how fans could integrate the Mini into their daily fashion, whether that was on a tote bag, a dog tag, or a key ring. Tellingly, the Mini was excluded from that year's D-1 Grand Prix, while the preceding Digimon Accel and succeeding Digivice iC and Burst both had their own competitions. Although it was briefly the subject of the manga Digimon Next, it wasn't a device primarily targeted at children. The Mini was advertised in its promotional video as "compact, light, and historic." The Mini restored the background images that the previous Accel pets had ignored, and also reverted the sprites back to the more nostalgic 16x16 instead of the 32x32 sprites that had been used since the Progress toys in 2002. 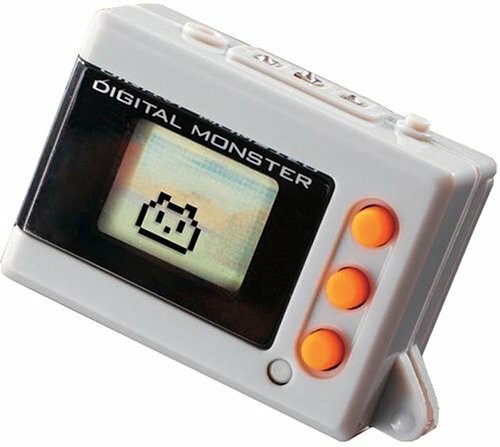 The Digimon Mini's relationship to the original Digimon Monster series was similar to that of the Tamagotchi Mini and its own forefather. The Mini was about 70~80% the size of original Digital Monster series, 3 x 4 cm vs 4 x 6 cm. The Mini was popular enough to lead to a cross-promotion deal between Bandai and clothing brand UNIQLO, creating five different special editions, each promoted with a corresponding article of clothing. It ultimately came in the third-largest variety of color variations among any Digimon pets, after the Pendulum and original Digital Monsters. At least thirteen varieties of Mini were distributed in its lifetime; two colors for each original release, five special editions with a limited production run, and two giveaway exclusives. Archived promotional image from the official website. Rather than just being a straight port of its Digital Monster predecessors, the Mini included many of the innovations introduced by the similarly-successful Pendulum series. First among these was the attribute system, where Digimon were classified as Vaccine, Virus, or Data, and gained an advantage when fighting attributes with a weakness to them. And instead of a best-of-three battle system like on the Digital Monster pets, the Mini gave each Digimon six hit points, with one Digimon's attack hitting each round and the other dodging until one of the combatants fell. Although it did not have an actual pendulum counter, the Mini had a similar pre-battle "count" feature, controlled through button inputs rather than shakes. At the beginning of a battle, the tamer would rapidly mash the A button to match that Digimon's specific tempo and try to score a terahit, and after the three-second period was up the battle would play out. In addition to the Vaccine > Virus > Data triangle from the Pendulum series, the Mini introduced a Super Ultimate evolution for each version, which evolved from that pet's Ultimate by having 100 or more wins. For Ver. 1 this was an evolution from War Greymon to Omegamon, for Ver. 2 this was Heracle Kabuterimon to Tyrant Kabuterimon, and for Ver. 3 this was Holydramon or Piemon to Lucemon Satan Mode. Bizzarrely, there was never a Data-attribute Ultimate or Super Ultimate available on the Mini. All fully evolved Digimon on the Mini were either Vaccine or Virus-attribute. The Ver. 1 Mini is notoriously more difficult than the Ver. 2 or Ver. 3, as on the Ver. 1 even with a cumulative winning percentage of 80~100%, the probability to evolve to the Perfect and Ultimate stages is lower by as much as 30%. This was likely to compensate for Omegamon having an overwhelming advantage versus the Ver. 2 and Ver. 3 Super Ultimates. At present Minis average $65 for new-in-package on the secondary market, one-third the price of packaged Digital Monster pets, and about equal with loose DM toys. You know where can i find it for a reasonable price?